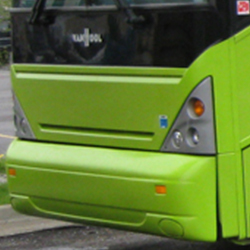 When chartering a bus there are really three things you are paying for. You need honest and professional support staff, knowledgeable and caring drivers, and safe and comfortable vehicles. GTS can promise you all of the above. Our vehicles come in varying sizes and amenities so please talk it over with your customer service agent to ensure we find the right vehicle to meet your needs. We do not advertise vehicles that we don’t own. We follow through on our promises, and go the extra mile to make sure every customer is completely satisfied. Everyone on staff here including the office, drivers, clean-up crew, and obviously the mechanics, receive training to identify possible vehicle issues before they cause a problem. 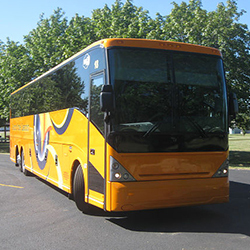 We go carefully through every bus prior to your trips departure to ensure we arrive prompt; the amenities are working as they should, and we finish the trip without any service delays. No company can guarantee that their vehicle won’t have an issue come up. They are only mechanical pieces of equipment, but what we can guarantee is that we are taking every precautionary step so that your group is absolutely ecstatic with the service and equipment you received. 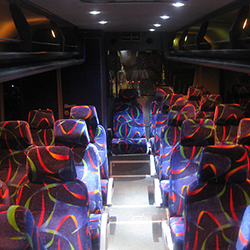 Our 55 -57 passenger vehicles have forward facing seating with all the listed amenities. They are great for large groups going anywhere in the U.S. or Canada. With all the under-vehicle storage your group can pack enough luggage to be gone for weeks if needed. We have used these vehicles to carry Sports Teams and Corporate Outings, Seniors to a Casino or Students to Chicago or Washington DC. We have done Family trips staying around town, or going to Disney in Orlando. We’ve done it all in these vehicles. They are the perfect way to keep your group together with organized travel. Why fly when you’re still going to need transportation when you get to your destination. Let us take care of it all for you. You’ll be glad you did. 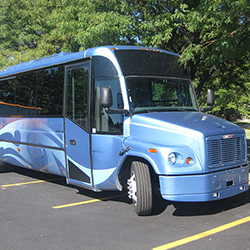 Our 29 passenger vehicle is also forward facing with all the listed amenities. Don’t let it’s size fool you though… The supension isn’t like a party-buses. It’s more like a mini-bus on steroids. It ensures that a group can take this all the way to Florida and truely ride in comfort. It’s great for smaller sports teams making a 4-day weekend tournament or a group of family and friends going on a pub crawl. It has spacious rear closet storage that allows for at least 29 large suitcases. There is even more space in the interior for carryon luggage and coolers. This vehicle type is the perfect choice when a full-size coach’s costs too much and you still want your transportation taken care of. Our Minibus ensures that a group can take this all the way to Florida and truely ride in comfort. It’s great for smaller sports teams making a 4-day weekend tournament or a group of family and friends going on a pub crawl or heading to the Casinos. It has spacious rear closet storage that allows for suitcases. There is even more space in the interior for carryon luggage and coolers. This vehicle type is the perfect choice when a full-size coach’s costs too much and you still want your transportation taken care of. 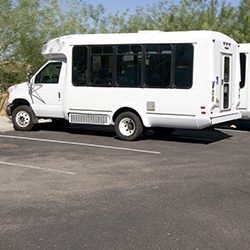 ALL of our vehicles have the industry standard amenities and MORE… These amenities keep your group and vehicle safe, the passengers comfortable and entertained, makes the time fly by, and are practical for many groups and their needs. We do everything we can to try to ensure your group gets where they want in a timely manner safe and sound. No company can 100% guarantee no vehicle issues, But every company should be able to promise that rigorous checks were done to the vehicle BEFORE it left the garage. We do that and more. When checking with who you go with, ask them if they have their own shop and mechanics. If they don’t then how are they getting every vehicle checked out before it goes out on every trip? What are they doing to try to make sure your bus doesn’t have any issues? If you do have a problem with ANY of our vehicles, we will try to get it fixed while you are out on the road. If we can’t we will replace that vehicle EVEN if that means we have to hire another company! That’s our guarantee to you.